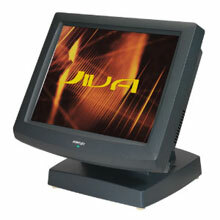 The Posiflex Jiva 8000 features a blazing fast 2 GHz Intel Celeron processor and the option of 256 or 512 MB memory. The Jiva 8000 also offers a choice of 15" touch interfaces, including a resistive version and a scratch-free infrared version. The spill-proof construction keeps the Jiva 8000 working even when coming into contact with liquids or other potentially damaging materials, making it a great choice for restaurant and hospitality installations. The base includes space for an optional UPS battery plus a primary hard drive - store all your data in one location and keep it running no matter what! The Posiflex TP8015T4NOS-AT-B is also known as Posiflex Business Machines	POS-TP8015T4NOSAT-B	or TP8015T4NOSATB	.